We get up a bit earlier than normal at 0740 and decide to head off as it has been calm overnight and the wind now is less than 10 knots. Our plan is to cross the Wide Bay bar at high tide (just after 1300) if the conditions are suitable. It will take us over 4 hours to get there as we will be running against the tide all the way. Michael takes Veto to the beach and we then have breakfast. We head off at 0830 after a lot of trouble trying to raise our anchor. The bottom here is all sand/mud, but when we winch the chain in the boat's bow gets pulled down. We figure that the chain (not anchor) is hooked onto something, probably a tree. After a bit of moving the boat around, the chain comes free and we can pull up the anchor. 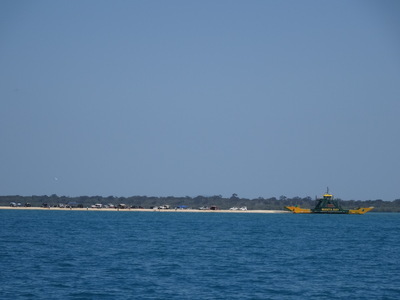 We motor via the channels to Inskip Point. There are a couple of shallow bits but there is plenty of water and there are good leads for these sections. Kelly logs on to Tin Can Bay Coast Guard and advises them of our intentions. We hear a couple of boats cross about 2 hours after low tide, some going in, others out. The reports they give vary from 1.5 metres swell to 0.5 metres to 2.0 metres. They all agree that there are no breaking waves in the channel. The wind has stayed around 10 knots, so we decide to go for it. Catalina calls us and advises that they exited via the Fishermens Passage and it was okay. We have no marks for this so we will not use it, but it does look good as we pass. At Inskip Point there are dozens of four wheel drives on the beach and dozens more waiting to board the vehicular ferries to go over to Fraser Island. We see the huge sinkhole that opened in the camping ground last week, swallowing a car, caravan and trailer. There are lots of people on the beach looking at it. The run out to the actual bar is called the "Mad Mile" as it runs parallel to the swell. It is very rough as we have a side on swell for the whole way (actually almost two miles). To navigate out the bar, you are given two waypoints by the coast guard (sent via SMS) and plot these on the chartplotter. The ones we got a few days ago are different to the ones we were given in May. It calms up as we get to Waypoint 2 (the inside one) as the swell is now coming through the bar and not getting messed up by the sand bank. We have been catching a small monohull as we came up the Mad Mile. The bar has some large swells, probably two metres in some cases. The direct line between the two waypoints is a bit close to breaking waves on our starboard side, so we go a bit further to port and run parallel to the given line. The first part of the bar is about 10 metres deep and easy. The second part shallows to 5 to 6 metres and the waves stand up a lot more. To make things worse for us, we have caught up to the monohull and have to slow to almost idle speed as it is too narrow to pass. Once we get out a bit we speed back up and pass to the south of them. Once we are out, we turn towards Double Island Point and pull out the genoa. This gives us a knot. The seas are now a nice rolling swell and it is a good motorsail. 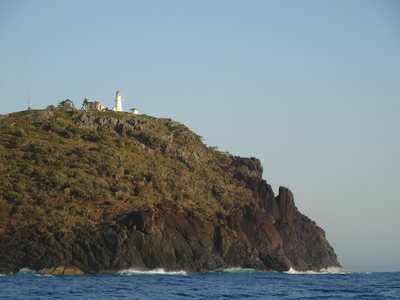 We arrive at Double Island Point and anchor at 1500 in 4.4 metres (with 0.8 m to drop). There is a side on swell hitting us, but it is not too bad as there is a lot of distance between each swell. We hope it will improve as the evening and night goes on. The beach here has hundreds of four wheel drives on it. There are lots of groups, one seems to have a few dozen vehicles and all the people are in one spot. As the afternoon goes on, the vehicles depart till there are almost none left at sunset. We have showers and then sundowners and a barbecue. Tonight is the NRL grand final but when we try to retune the television, we get no channels at all. We listen to it via ABC Radio. The grand final is an all Queensland match, with the Brisbane Broncos playing the North Queensland Cowboys. We are hoping the Cowboys win and they do. It is a very close game, with the Cowboys scoring after the final siren to equalise. They then miss the conversion, but in the first minute of the golden point extra time kick a field goal to win. It is considered by most to be one of the best grand finals ever (of course not as good as last year when South Sydney won!!!!). The swell lessened overnight but there was still a fair bit coming in right through the night. Michael slept well but Kelly only had a good sleep after 0300. We get up at 0500 and after making tea and coffee, we head off at 0530 just after Catalina leaves. 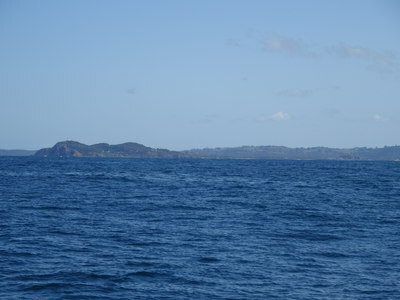 We motor out around Double Island Point and head south. There is only 3 knots of wind, from the south-west. At 0615 we pull out the genoa as it has increased a bit. We get 0.5 to 0.75 knots extra, giving us about 5.4 knots in 7 to 9 knots of wind. This does not last long as the wind dies and goes south, we pull the genoa in. We put it out and pull it back in a few times as the wind is all over the place. Kelly has a lot of problems trying to contact Mooloolaba Coast Guard. It looks like there are some very strange atmospheric conditions that are causing problems for VHF radio, TV and even mobile phones. 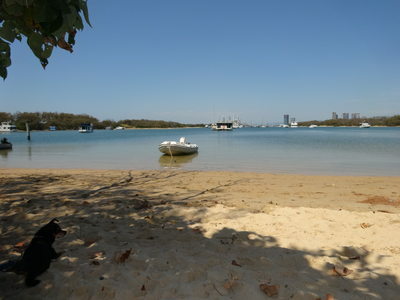 We finally are able to contact Mooloolaba to log on with them and then log off with Tin Can Bay. 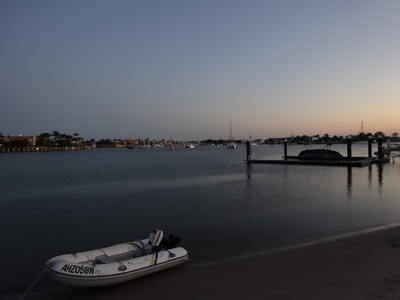 It also does not help that Mooloolaba uses channel 73 for communications when this is also used by Hervey Bay, Bribie Island, Redcliffe, Caloundra and Seaway, all of which are within 60 nautical miles of Mooloolaba. We cannot work out why they all do not use a different channel, or at least a few different channels. 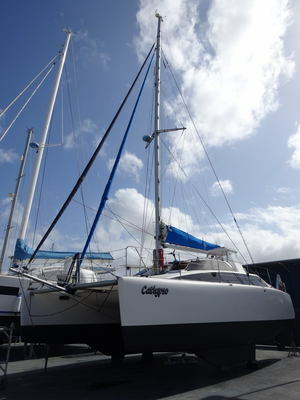 Tomorrow Kelly will book us into The Boat Works at Coomera on the Gold Coast for Wednesday (the day after tomorrow). We are going to haul out there and redo the anti-foul as well as have a few other things attended to. 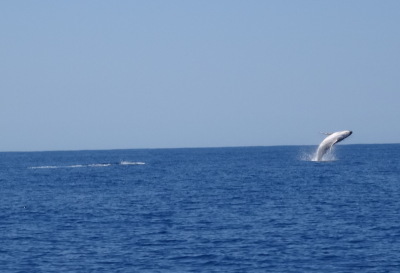 We pass Noosa Heads at 1045 and see the first of a number of humpback whales. We see a baby breach about four times, fantastic. We also see some dolphins, a large turtle and even a small crab (no idea why it was swimming along on the surface in 50 metres of water). At 1245 we swap from the genoa to the screecher and are doing almost 6 knots (of course with one engine running) in 6 knots of wind. There are huge numbers of boats on the water, we see lots and hear them on the VHF. The swell this morning was still 2 metres with an occasional 3 metre wave, but by 1400 it has dropped to 1 to 1.5 metres. As we enter Mooloolaba, an idiot boatie cuts in front of us from outside the channel approach. Another one comes out the channel on the wrong side and squeezes between us and a marker. Later we have another one come out of the marina and then proceed to go slowly parallel to us and just ahead. He then suddenly pulls across right in front of us. It seems that the October long weekend is when all the useless Queensland boaties come out, a bit like Boxing Day, New Year's Day and Australia Day in Sydney. At least half a dozen small boats do very stupid things as we proceed up the river. 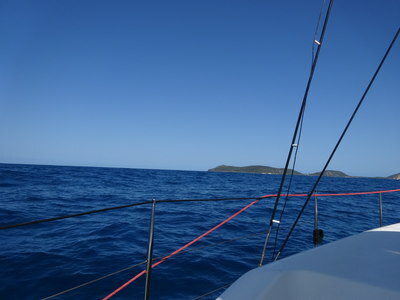 We end up safely navigating to the anchorage to the north of Mooloolah Island. There are lots of boats here, many appear to be almost abandoned. We find a spot and anchor in 2.4 metres at high tide. It is 1500. Michael takes Veto to the beach, she is very relieved and happy when they get there. We have showers and Kelly has a short sleep to try and catch up on the sleep she lost last night. At 1700 we go to the beach again and have sundowners in the nice park behind. When we get back to Catlypso, Michael checks the rear starboard bilge for water. There is no more there than Thursday when he last checked. This means that it is very likely that he has found the leak and successfully sealed it up. 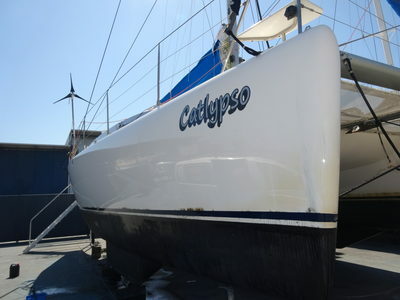 A bit after this we have to move Catlypso as two derelict yachts (moored together) are far too close to us. It looks like they have a very short anchor line out and have merely pivoted on their bows when the tide changes. We move about 20 metres to the west and are much happier. Kelly cooks pumpkin gnocchi for dinner. 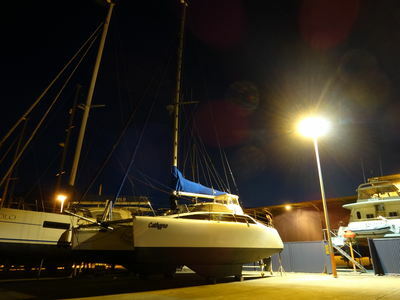 We go to bed relatively early as we plan to be up at 0500 again as we want to get as far south in Moreton Bay as we can. It was calm of course overnight, we got a great sleep, but Michael woke at 0300 and could not get back to sleep apart from one small period just before we woke at 0500. Once up, Michael takes Veto to the beach while Kelly makes tea and coffee. On days when we start early, we do not have breakfast as neither of us can stomach food this early. We leave at 0530 and motor out and around the headland. Once we are here, we decide to head for the North East Channel rather than the Main Channel as the wind is from the south-west and it will assist us more. We pull up the main and the screecher in 8 knots of wind. We are doing 6.5 to 6.7 knots with one engine on. We need to run the engine as we have to average at least 5.5 knots today to make it to a spot where we can get to Coomera tomorrow by lunch time. 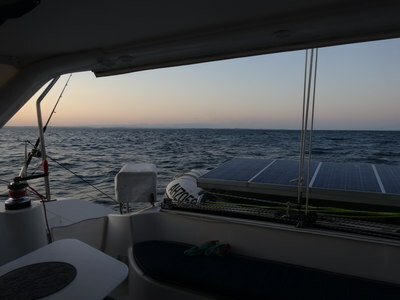 At 0700 we turn off the engine and sail at 6.5 to 7.3 knots in 10 to 12 knots of wind. Unfortunately, the wind dies within 30 minutes so back on goes an engine. 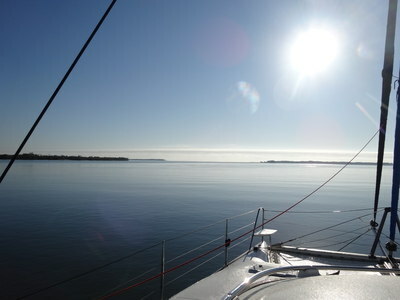 We motorsail till we get to the North East Channel which leads into Moreton Bay off Brisbane. This is not a really shipping channel as it is too shallow for commercial ships. As we approach, we have four large humpback whales cross our path, so we have to slow down to avoid them. 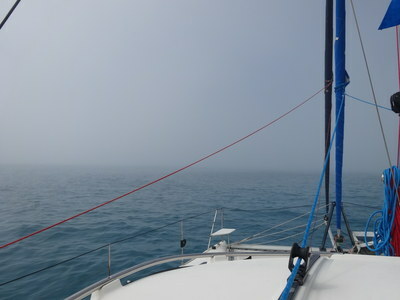 Once we are in the channel there is thick fog. We turn on the radar and use this to assist in navigation and to avoid hitting any boats. As it turns out, the channel markers are totally different to the charts on our chartplotter and laptop, so the radar helps. The fairway marker (well, we assume it is, hard to tell) looms out of the fog suddenly, but we were expecting it from looking at the radar. The photograph above shows the radar as we approach Cowan Cowan. We have only used the radar a few times since we got Catlypso, mostly when we have done very early starts. 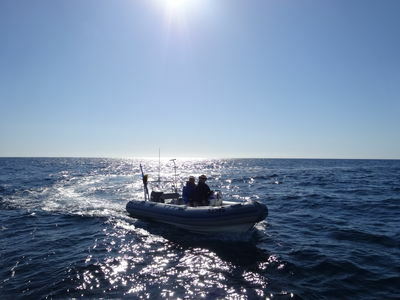 Today we get to use it in conditions that let us experiment with the settings as well as see what small boats look like (since most early starts have had no other boats around). beach at left are collapsed gun emplacements from WWII Kelly and Veto, look how calm it is! It is actually amazing how well small boats (even tinnies) show up on the radar. The fog has very thick sections where we can see only a few hundred metres and then clear patches of a kilometre or so. 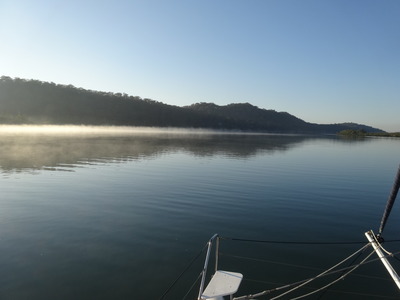 Once we get to Tangalooma the fog has almost totally disappeared. 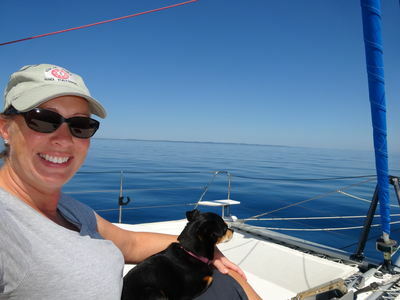 We continue motorsailing, but at times have to pull in the screecher due to the wind direction. We have a good tidal current behind us, so we are doing 6.4 knots at times. 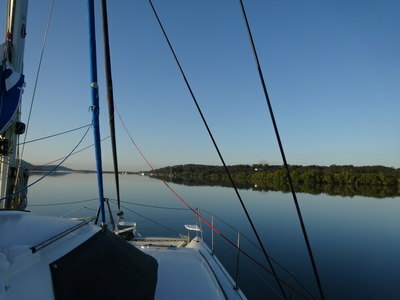 Further on the wind goes to less than 3 knots and the water is very glassy. Michael adds 44 litres of diesel from containers to the main tank and flushes the watermaker, that is how calm it is. 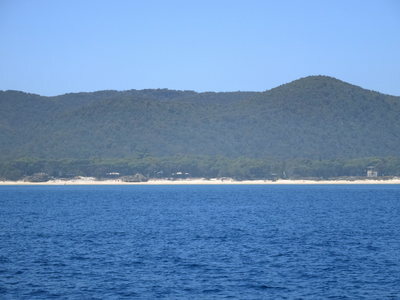 We are coming down the western side of Moreton Island, using the channels closest to the island. We pass a nice anchorage called Blakesleys Camp. Past here there are probably almost 100 crab pots, most of which are in the channel, many even in the middle. It would be dangerous to navigate at night. We cannot believe that it is legal to put them in a channel. 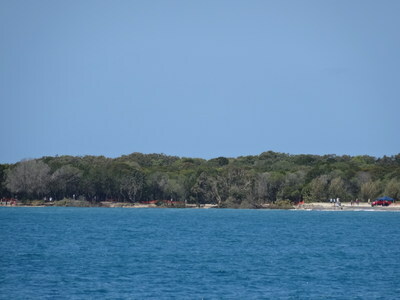 We come around through the channel to the east of Russell Island and past the Royal Queensland Yacht Squadron property at the end of Canaipa Point. There is a nice looking anchorage here as well. We end up anchoring off the southern side of Canaipa Point in 3.2 metres at 1735. We take Veto to a beach and then have showers and sundowners. Kelly cooked lasagne as we motored the last section and we have this for dinner. This is the longest day so far on this trip and possibly the longest day we have had since we got Catlypso. 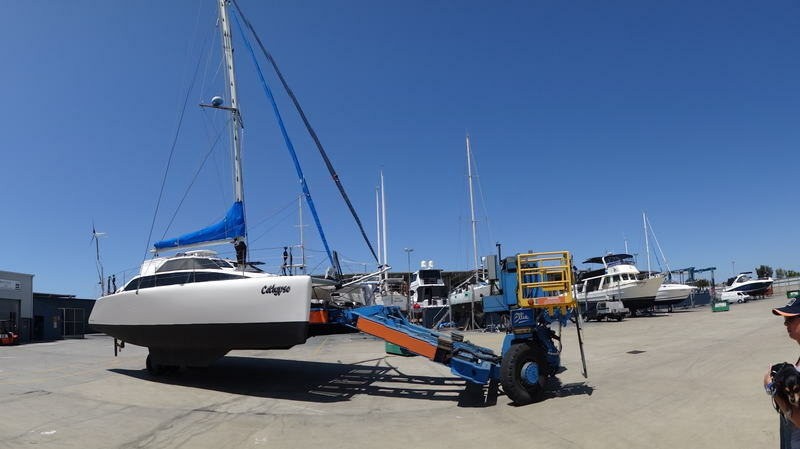 Today Kelly booked us into The Boat Works at Coomera on the Gold Coast. We are booked in to get hauled out at 1230. 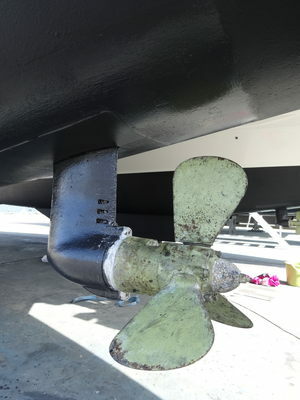 We will be antifouling the hulls and getting the sail drives and props serviced as well as some other minor things. She also arranged for the various tradesmen to come and do the work we need. We will again have an early start to make sure we cover the 20 nautical miles in time to be at The Boat Works for the lift out. We have a good night's sleep in this very calm waterway. We get up at 0500 and after Michael takes Veto to the beach, we motor south along Canaipa Passage. We have the tide behind us till we get to Jumpin Pin (an access to the ocean) when we run into it for the next few miles. We have a bit of a problem here as our chartplotter and the book we are using (Lucas) are both totally wrong with regard to the channel. We end up with only 0.9 metre below our hulls, so we have to backtrack a little till we get some deeper water. We figure out that some channel markers very close to the eastern shore mark the channel south. We confirm this with one of the charts on Memory Map running on our laptop. On the chartplotter we again run through land. Once past here the channel is roughly as per our chartplotter. 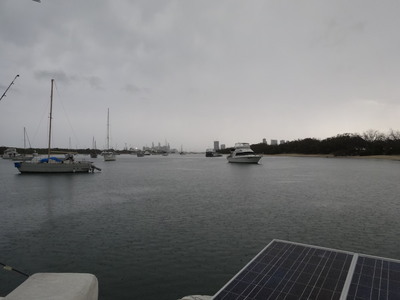 We turn into the Coomera River at the Broadwater and motor upstream past all the multi-million dollar houses, past Sanctuary Cove Resort and all the marine places to Coomera and The Boat Works. The Boat Works is a huge complex where we were hauled out last year and where Michael and our friend Heinz anti-fouled the boat. We have a booking for 1230 but Kelly phones to see if we can get hauled out earlier. They advise us to tie up to their wharf and that they will haul us out within the hour. We tie up and Kelly goes ashore to book us in. We are hauled out at 1040 using the Sea Lift, an International Rescue/Thunderbird looking contraption. The hull is pretty clean considering it is now 16 months since we anti-fouled it and over two months since Michael last scrubbed the hull. 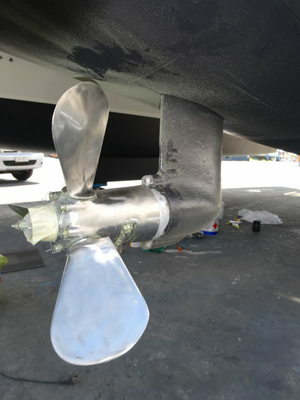 The only real growth is around the sail drives and on the props, the anti-foul here is a different type (as the sail drives are aluminium) and is obviously not as effective. 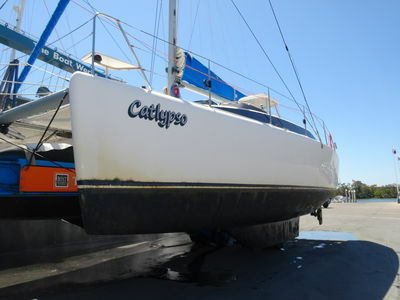 After a water blast clean, Catlypso is moved to her temporary home on the hardstand. 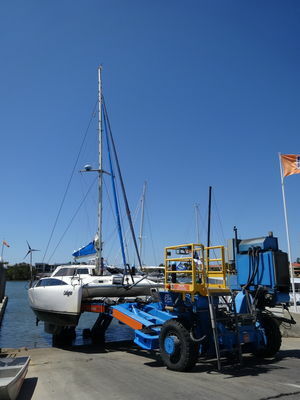 We plug into shore power and then walk up to see the company that is doing our sail drive service. We then go to the ship's chandlery and purchase the things we need to do the anti-fouling. They do not have in stock the anti-foul we want to use (Amercoat ABC 3) in the 10 litre size we need, so he orders it and it should come tomorrow morning. We get the anti-foul for the sail drives, a different one to last year. We get one litre of the Jotun Antifouling Seasafe Ultra. Hopefully this is better than the stuff we used last year. After lunch, the bloke who is doing the hull cleaning arrives. 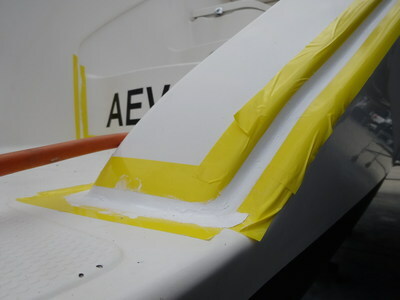 He is to acid wash the above water sections of the hulls, remove the stripe along the sides and prepare this section for antifouling. It needs to be sanded and have two different "paints" applied so the anti-foul will stick. He will also wet sand the area near the old name decals to try to make the old name disappear as you can see it in certain circumstances. Catlypso before being acid washed Catlypso after acid washing! The sail drive bloke also comes and he pulls the props off and starts the service on the drives. The port one has a tiny bit of water in the oil, but nothing to worry about. We are getting the seals on the prop shaft changed so this should fix that problem. He leaves once he has removed the oil, no idea when he is coming back. Meanwhile, we start preparing the hulls for anti-fouling. We scrub the hulls with some great rough pad material we purchased. 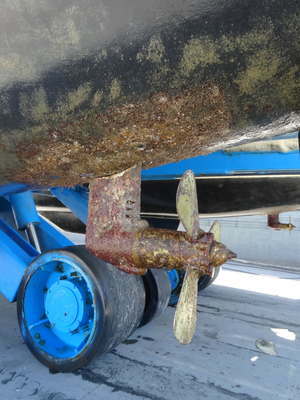 We also need to use a paint scraper to remove some barnacles. Kelly also concentrates on removing the growth around and on the sail drives. 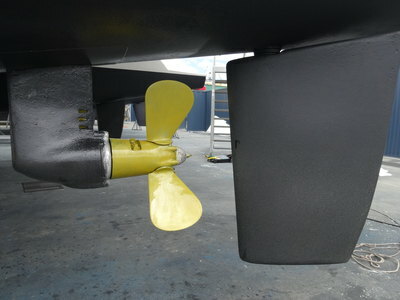 We are also replacing the rubber skirts which fit around the sail drives. The bloke says that a guy working on the boat next door makes fibreglass ones that are not only cheaper, they last longer. We will get them. It takes us about three hours to totally clean the hulls, the hardest part was removing the growth on the sail drives, especially where it sits up inside the hull. It is quite hot today and at 1600 we have a beer as we finish the last of the work for the day. At the day's end we have the hulls ready for painting, the sail drives are partially serviced. 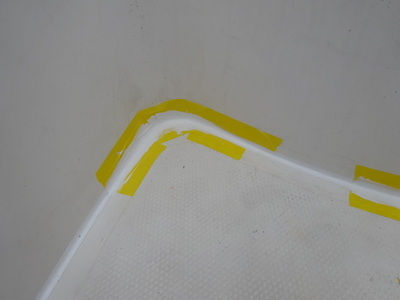 In addition, the hull sides are clean, the stripe removed and a guide tape in place for the raising of the anti-foul. We are well on track to do everything we want to do here. We are filthy, so Kelly goes for a shower while Michael watches Veto. 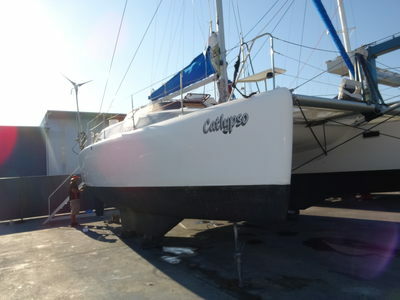 Roger, owner of Lightwave Yachts who built Catlypso comes over to give us some advice. He is very helpful and tells us what to use to fix the leak in the rear starboard transom as well as some other things. After this Michael has a shower and at 1800 we go down to the grassy area in front of the cafe and have sundowners. Back at Catlypso we have left over lasagne for dinner. We go to bed early as we have had a lot of early starts lately and we expect we will be woken fairly early tomorrow as the workers start. Sure enough, we are woken at 0630 as not only did our bloke turn up to do anti-foul preparation, all other places started work. We get up and take Veto for a walk. Kelly puts on a load of washing (free laundry) and then we have breakfast. After breakfast, Michael anti-fouls the sail drive and the area around it. We are going to paint this as many times as we can with the one litre we have. He easily gives it one coat, using probably one fifth at the most of the can. He also paints up as high as he can where it sits inside the hull. We should easily be able to do five or six coats. Later the bloke from All Yacht Spas who did our rigging replacement last year checks out the tension of the stays, all is well. He also gives us some advice about our bowsprit and the screecher furler. The perparation work for raising the top of the anti-foul is soon completed (it was an easy job but the cost of the materials for us would have been more than what we ended up paying someone to do due to the small quantity we actually would use). Michael then puts tape along the top edge of where the anti-foul will go, the existing one had to be removed once the primer had gone on as this would have stuck to the tape and possibly came off when the tape was eventually removed after we anti-fouled. While Michael is doing this, Kelly goes shopping in the courtesy car. She gets some food items as well as diesel in all five containers. The blokes who are doing the small gel coat repairs come and grind and bog the spots. These are the sections damaged back in Ballina and Mooloolaba, the spot where the wind generator blade hit and a small spot on each bow where something has hit us causing a small starburst. Michael goes to the chandlery and gets the ABC 3 anti-foul we ordered. He then touches up the small bits where the water blasting has blown off a few layers back to an older blue coloured anti-foul. We then anti-foul the section above the existing anti-foul. Then we do both hulls as well as another coat on the new bit. After this Kelly removes the panels in the bows that give access to separate floatation sections. There is a little water in bottom of the starboard one but a huge amount in the port one. She removes the water from both. She then spends time removing the silicone from around the fittings above both bows where we suspect the water has entered. 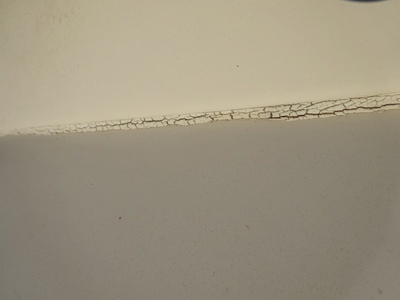 This silicone is in very bad condition. Michael does a second coat on the sail drives. The props are also now all back together, with the service completed and new anodes installed. We finish at 1615 and have showers and then go down to the restaurant/cafe. There is a special tonight for drinks between 1700 and 1800 and pizza. We have two pizzas and five beers, $56 total. The pizzas were really good, probably the best value we have had for a long time (and we know the best places around our dive sites). It starts raining about 1730 and continues till very late. It is also very windy. We are up just after 0600 as the tradies have started work all over the yard. Michael gives another coat to the sail drives and then he does the inside of the hulls where it is protected from rain. The rain means that we are limited in what we can do at the moment. Michael decides to anti-foul the insides of the hulls from the front of the mini keels to the props as this is protected from the rain. At 0745 he has finished and we have breakfast. We cannot do more at the moment due to the rain. After breakfast, Michael goes and gets another four litres of anti-foul as we will not have enough to do two coats (this is the same as last year). He also goes to the sign shop and has two new "Lightwave 38" decals made to replace the ones we removed when increasing the anti-foul level. The rain stops about 0930 so the young bloke comes and finishes fitting the fibreglass skirts around the top of the sail drives. Michael then anti-fouls them. We then anti-foul the rest of the hulls that Michael did not do when it was raining. We go to the cafe and have a coffee/tea with raisin toast, free courtesy of The Boat Works. After this we do another coat of anti-foul. We look like we might run short for a full three coats, so the section between the props and the stern do not get another coat. We need to keep some anti-foul to do the spots where the boat is resting on blocks. This is four bits under the mini keels as well as one small spot on a bow and another on a stern. We cannot do this till just before we are put back in the water on Monday. The blokes doing the gel coat repairs are back and start work on this. After lunch, they are finished and all that needs to be done is sanding. This will happen on Monday. Michael adds 60 litres of diesel from containers to the main tank, it is almost full now. Michael then removes the silicone from the joins around the starboard stairs. This has aged and started to fall apart. We think this is how water has been getting into the rear section of the bilge. Michael uses a penknife to remove it. He then cleans with acetone and then tapes it up so new silicone can be installed. However, the silicone we have is clear and it is obvious that this will not work, it looks awful as you can see all the defects underneath. He removes the small section of silicone he put in place. Tomorrow we will get some white silicone. Michael paints the sail drive skirts again. Meanwhile, Kelly has been removing the silicone from around the fixtures on the bow as we have been having some leaks from these, particularly the port bow. We finish and have showers, so nice after a hard day's work. We go down to the waterfront to sit at a BBQ table and have sundowners. These beers go down nice! After we go for a walk and look at all the boats on the long term hard stand, most are cats. We meet the caretakers and learn a bit more about the place. The Boat Works is owned by Tony Longhurst. His family used to live in Yowie Bay where we moor Catlypso. They then moved to the Gold Coast and his Dad built Dreamworld. Tony became a racing car driver and won the Bathurst 1000 twice! After he retired, he set up The Boat Works. His brother owns Riveria which is just down the river. For dinner we have a nice creamy pasta. It is much quieter this morning, obviously not as much work gets done on Saturdays. We get up at 0710 and Michael takes Veto for a walk while Kelly does the dishes (we need to take to the toilet area). After breakfast Michael goes and gets the white silicone we need. He then paints the sail drive skirt again. He then silicones the starboard parts he has prepared. He then prepares the port side. Kelly also silicones the sections at the bow she has been working on. Later Michael checks his work and finds that a few spots he did need to be done again as it needs a bit more. The detailer comes again and puts Propspeed on the props. This is the anti-foul and you cannot buy it to do yourself. We then filled the water tanks and Michael also discovers that the problem with the screecher furler last week was caused by the furler twisting. He sees that there is a hex bolt that seems to control this, so he adjusts and tightens and it seems better. We go to the cafe and have a coffee. We see the owner Tony Longhurst here, very unassuming, a ratty old T-shirt, boardshorts and thongs! After this Michael takes off the tape around the silicone work, looks good. 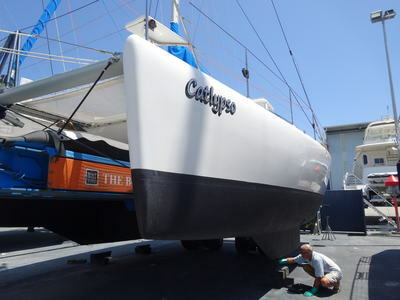 The detailer is back again and is now polishing the hulls. Kelly decides to clean the stainless steel lifeline stanchions and some other stainless bits. Michael puts another coat on the sail drives and cleans the boat speed wheel. We discovered the other day that it was in back to front. There is an arrow on it and Michael had always assumed that this should face the bow. No, it needs to face the stern. We again go to the waterfront and have sundowners. We meet a couple off a power boat Liberty (John and Annie) and they tell us that they are friends with Pilgrim. You may recall that we heard over the VHF radio one person was taken to hospital from Lady Musgrave Island with a coral cut. Well, it turns out that the owner was diving (not sure if scuba or snorkelling) and he was hit by the prop of a RIB that was supposed to pick them up. He had to have 38 stitches put in the cut on his leg. We saw a photo, very bad indeed and hard to see how the hell this could have happened. Anyway, he was in Bundaberg hospital for three days. Today they arrived in Broken Bay. After this we come back and have a barbecue, nice steak and sausages. We later go for a walk and look at some other yachts for sale. We get up at 0800 as it is much quieter here this morning. Michael takes Veto for a walk and chats to Ross and Narelle from Alexis. 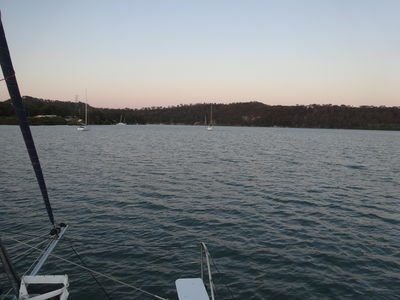 Their home is Gunnamatta Bay, a few bays away from where we moor Catlypso in Port Hacking. After breakfast Michael does some more joint resealing, almost the last that needs to be done, well, at least for now. Kelly does some more clothes washing and then she silicones the underside of the bow fixtures. She then reinstalls the bulkheads and removes the rest of the felt in the starboard side bow. Michael later drops Thunderbird 2 down and reglues the protective strip to the port stern side (he has glued this twice before but hard to do properly in the water). He also lets out all the water from the rain a few days ago and then hoses all the sand out. After this he removes some of the ropes that we put in for diving (to hold gear etc). While Kelly does some more stainless steel polishing, Michael flushes the watermaker, this time catching the water that comes out to measure it. It seems about 15 litres is used for the recommended 2.5 minute flush. After Kelly cleans the ladder and removes the silicone around its fittings, Michael puts new silicone in. We go to lunch at The Galley, the restaurant/cafe at The Boat Works. Bob and Sandra from Ray of Sunshine are there and we sit with them. We not only have a very nice meal, we enjoy listening to Bob's tales of their more than 20 years of adventures. After lunch Michael removes some more silicone from the joints between the cabin top and the main hull sections at the bows. This is in very bad condition. He refills with new silicone. After showers we have sundowners with Bob and Sandra on the river front. When we get back to Catlypso, we are not that hungry considering the lunch we had, so we just have soup. We are up early as the tradies are all at work, even the bloke doing our hull detailing. He starts on the port side polishing. Michael takes Veto for a walk and Kelly washes the dishes (at the toilet area). After breakfast Michael removes the tape from the bow joints, all okay. Michael then paints the sail drive skirts one last time and cleans the stove burners. Two of these have not been working properly for a few weeks. Kelly has gone off in the courtesy car to get some more diesel and some food items. The gel coat repair jobs are sanded back and then the bloke doing the detailing wet sands the rear sections of each hull. This is to try to get rid of the remains of the mark left by the logo of the boat's old name. He sands with 1600 and then 2000 sandpaper and then cutting compound and finally polish. When he finishes we cannot see the logo mark anymore. Hopefully this will stay like this. Michael puts silicone in the joints near the gel coat repairs. Michael then puts the new "Lightwave 38" logo on the port stern side of the hull. It looks good. As we are the next booking for the Sealift, at 1050 the blokes put it under Catlypso and lift us off the blocks. This means we can anti-foul the areas where she has been resting. We scrape the barnacles off the bottom of the mini-keels and then apply anti-foul here as well as at the port stern and starboard bow where there were other supports. We end up putting five coats under the mini-keels and also put a third coat on the inside of each hull astern of the props which we did not do a few days ago as we needed to make sure we had enough for the mini-keels. At 1200 we start moving to the water and we are soon afloat again. At first the engines are not putting out much water from the exhausts, but the port one is soon okay. The starboard one comes good a bit later, we think they get air locks. 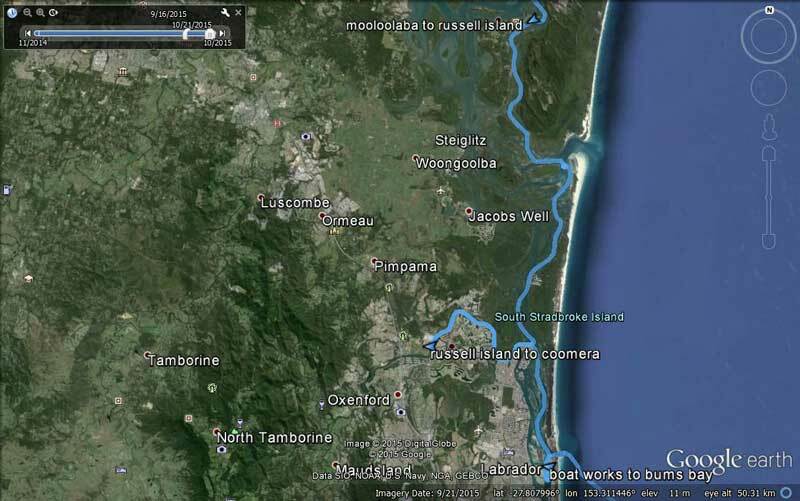 We motor down the Coomera River and then towards Southport. We have the tide behind us. 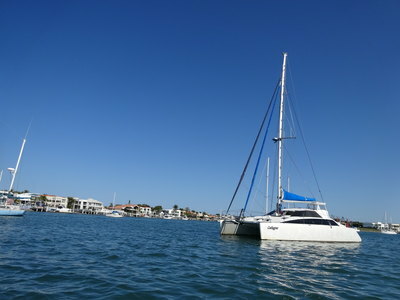 We anchor at 1425 in Bums Bay which is to the north of Sea World. The place is pretty full, but we find a spot about 30 metres from where we anchored in May on the way north. It is blowing 17 to 22 knots from the north. Kelly does some work and arranges for her Mum to meet us her tomorrow. 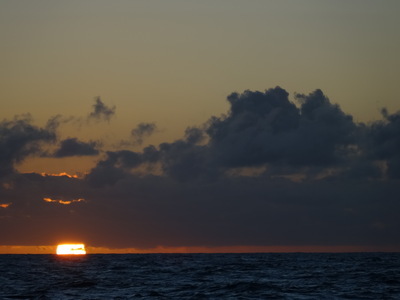 We would have sailed south tomorrow as the winds will still be from the north but she has to work in the morning. Tomorrow night the winds are turning southerly, so we will not be leaving here till Friday when the wind will go back to east to north. At the moment it looks like this will hang around for at least four or five days, enough to get us most of the way back to Sydney. Late in the afternoon we take Veto to the beach for a run and then have showers and sundowners. Kelly cooks roast beef and vegies and Michael then updates the web site. The wind has now dropped to less than 5 knots. It was very calm overnight. We get up at 0745 and have breakfast. After this, Michael takes Veto to the beach for a run and later, he cleans the starboard steps a bit. They are filthy from getting on the boat back at The Boat Works. Later, Kelly has to do some work, a phone interview for a potential new staff member, so Michael takes Veto ashore again and they walk to the Seaway and out to the end of the breakwater. They see whales, dolphins and turtles! The conditions on the bar are pretty good considering it is a run out tide. They end up back at the beach at the end of Bums Bay waiting for Kelly to call on the VHF that she has finished. Michael continues reading "Game of Thrones", he is up to the first part of the third book by now. She finally calls at 1050 and they go back to Catlypso. Kelly's Mum, Mary, is coming to meet us and have lunch on the boat. She calls when she arrives at Sea World (by bus) so we go and collect her. While Michael waits at the boat ramp, Kelly and Veto walk to meet her. Mary brings Michael some more books to read (these will need to wait till our next trip) and some lunch. It is good to see her since we last saw her over five months ago when we stopped here on the way up. We take her back to the boat ramp at 1430. There are lots of thunderstorms out to the south-west again. By 1640 they are overhead. There is a lot of lightning, but the worst section passes to the north-west of us. We get a fair bit of rain, but this mostly stops by 1800. We have sundowners and then curry chicken and rice. It rains a bit more on and off during the night, nothing too heavy. 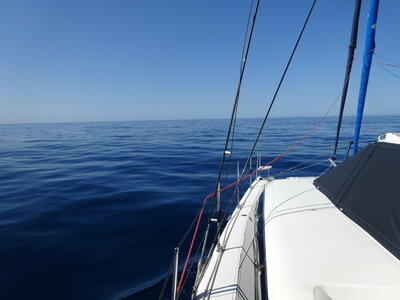 It was very calm, so much for the forecast of 15 to 20 knot south-easterly winds. There is little wind when we get up at 0815. We had our best night's sleep for weeks. We take Veto to the beach and then have breakfast. After this Michael polishes the back steps and the surrounds. Unfortunately the cutting polish we have is rubbish, it hardly removes anything. Anyway, it does look a lot better. Meanwhile, Kelly cleans out the second freezer that we decommissioned the other day as everything now fits in one. At 1130 we set off in Thunderbird 2 and head to Australia Fair, a large shopping centre. This is on the other side of the Southport waterway, but not too far away. Kelly is meeting her Mum again for lunch. It only takes 10 minutes or so to get there. There is a good wharf to drop her off at. You can tie off a boat for 20 minutes and could leave a tender there easily. Michael and Veto head back to Catlypso as we did not want to leave the boat unattended considering the forecast is for strong winds (which really never come). The wind is still from the north or north-east at less than 10 knots. Later Michael goes back and collects Kelly. At 1600 we take Veto to the beach and go for a walk along the whole length of the sand spit that forms Bums Bay. Veto gets very angry with a jet ski and decides to chase it up and down the beach as the driver performs pointless manoeuvres off the beach. We also dispose of some rubbish in the bins along the road (there are plenty). Back on Catlypso we have sundowners and Michael makes fried rice and then cooks pork spare ribs in smoky barbecue sauce. Earlier we finally got the south-easterly winds, but only 10 knots or so. By 2000 it is almost calm again. It is calm again overnight with a few small showers of rain. We get up at 0800 and have breakfast before taking Veto to the beach. This time we all walk to the Seaway and out to the end of the breakwater. We do not see any whales or dolphins, but we do see a turtle. There is about a metre swell running but the bar is very good. Back at Catlypso Michael cuts and polishes the port steps. After lunch he checks the oil in the engines, the starboard bilge (no water) and the port diesel filter. This has leaked a bit but not lately. He undoes it and then reattaches it and starts the engine to check it is not leaking. All seems okay. Kelly makes curry chicken and rice for tomorrow night's dinner and then tonight's dinner. Michael cooks some muffins. 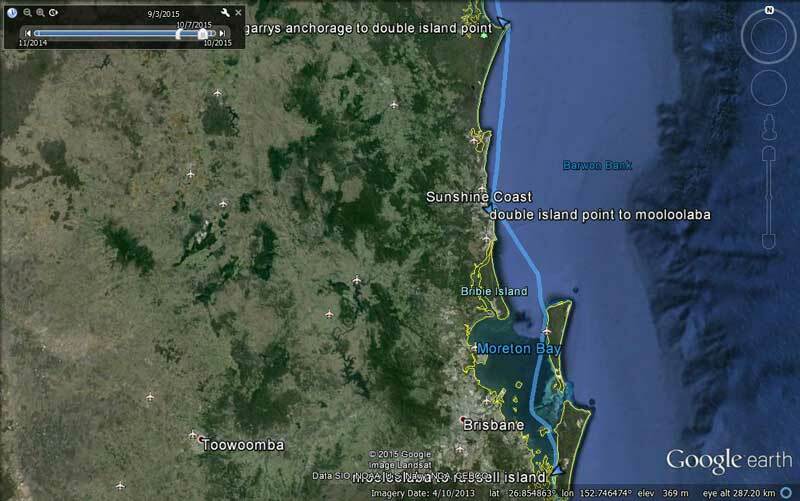 Our plan is to sail from here overnight to Coffs Harbour as the tides are not very good for crossing the Ballina and Yamba bars over the next few days. We take Veto to the beach and do a similar walk to yesterday. Once again she goes crazy when jet skis come past. When we get back to Catlypso, Kelly prepares the sails for tomorrow (removing covers and opening sail bag) and Michael sets up a couple of routes on the chartplotter. We have some garlic bread (instead of sundowners) and then the tomato chorizo pasta Kelly made earlier. We go to bed early as we want to leave about 0700 Queensland time. We lose an hour once we get 20 miles south and back into New South Wales as they have daylight saving now. We get up at 0615 and Michael takes Veto to the beach while Kelly makes tea and coffee. We leave at 0645 (Queensland time, 0745 NSW time which will be used for the rest of this blog). 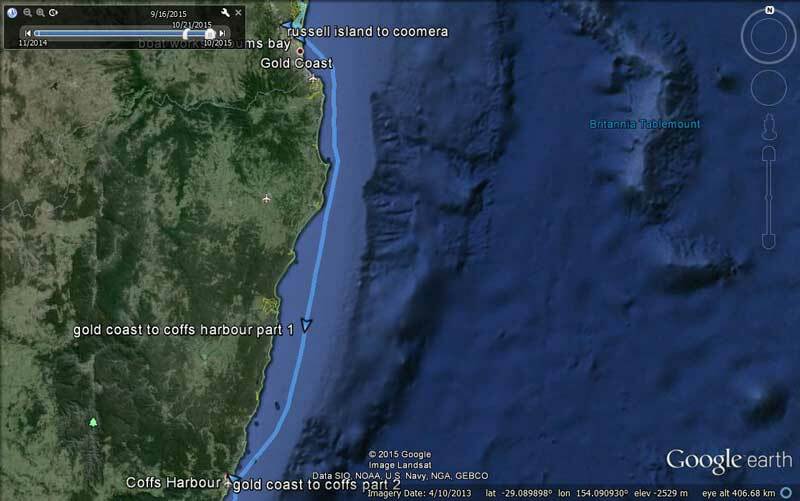 We log on with the Seaway Tower for an overnight journey to Coffs Harbour, about 165 nautical miles south. 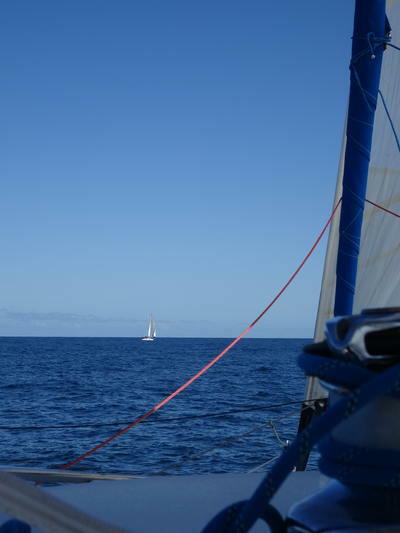 The wind is 10 to 14 knots southerly which means we can sail for at least the first part to Tweed Heads. We have the main and genoa up but also keep an engine running at 2000 rpm as we need to average 6.0 knots if possible. At the moment there is a tidal current of almost a knot against us. 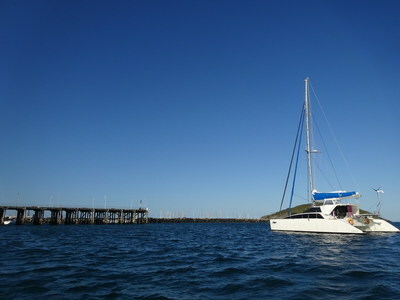 Five other boats also leave Bums Bay about the same time, most heading for Coffs. They are Two Up Together (which was at The Boat Works next to us), Wilparina and Mica who we have seen numerous times over the past five months, Norman and Trade Runner (who we saw at the Percys). 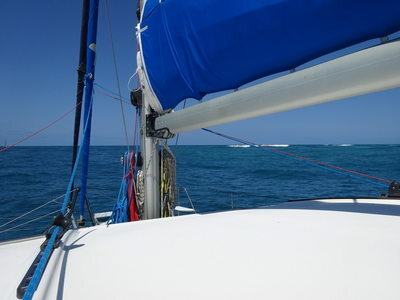 At 1050 the wind changes direction and we swap the genoa to the starboard side. We are now doing 6.5 to 7.0 knots. We swap to the screecher an hour later as the wind has turned to be more behind us. We maintain a similar speed, still with 10 to 13 knots of wind and an engine running (as we believe all the boats are doing). By 1320 the seas have calmed a lot, it was quite choppy earlier and also some large swells. Michael has a shower (first since last Sunday!) and dumps the holding tank. We turn the engine off at 1455 as we are doing well over 6 knots and the current against us has stopped. However, an hour later it is back on as the wind drops to 7 to 10 knots. 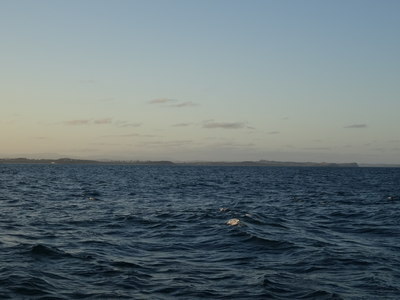 Norman decides to anchor at Byron Bay as he is sailing solo and Two Up Together tries to go into Ballina but abandons this when two trawlers come out and crash through the breaking waves. We later hear the trawlers discussing how bad it was. We see about 20 humpback whales before Byron Bay, some heading north (lost?) and more south of there. At 1800 we pass Ballina and at 1900 we go on night watch. 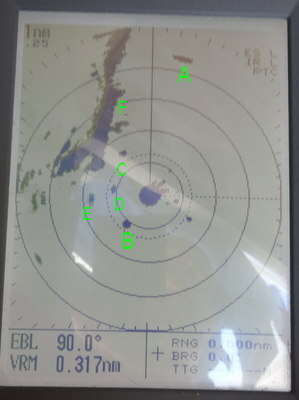 This means we wear lifejackets if outside the cabin, the radar is on and we reduce the sail area (we had already dropped the main as it was interfering with wind to the screecher) and then change to the genoa only as the wind increases to over 20 knots. We also have to work out how to dim the chartplotter (ended up Michael had to look at the manual) and the radar. Kelly takes the first shift till 2100. We are not hungry, probably because this is our first overnight sail (we have sailed in the dark before, leaving some ports very early). At 2100 Michael makes himself a hot chocolate and takes over from Kelly. She tries to sleep in the saloon but does not get any. At 2400 she takes over from Michael. Kelly takes over at 0000 and at 0115 a trawler that has been running parallel to us for hours (but well behind and off to starboard) decides to speed up and cut across our bows. Kelly gets Michael up (he had not yet fallen asleep). Despite calls on the radio, he continues to be on a collision course. Kelly cuts our engine and he passes only 0.25 mile in front of us. Far, far too close in daylight, let alone at night. 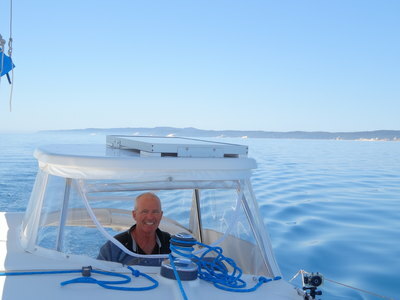 Is there any wonder boaties hate professional fishers when they behave like this? He motors erratically and later again cuts across our bows but at least this time he is almost a mile ahead. 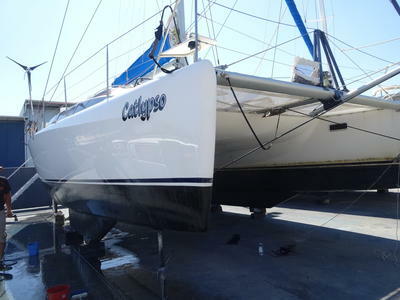 Soon after the wind changes to be a bit more off our starboard rear quarter so we swap the genoa over. Michael actually falls asleep and Kelly stays on watch till nearly 0500 rather than the agreed 0300. She says when she asked Michael to take over, he asked if he could stay asleep. Needless to say he does not remember this at all! The wind has gradually dropped since midnight and is now only 11 to 13 knots. The seas have calmed a lot as well. We log in with marine rescue as planned at 0000 and 0300 and again at 0600. Kelly falls asleep quickly and gets almost two hours before getting up. 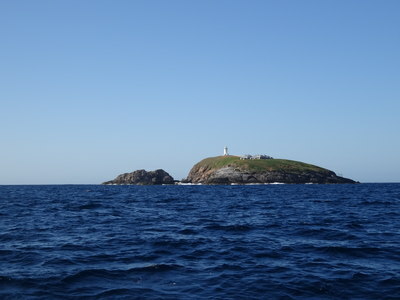 Michael decides to come inside South Solitary Island after passing well east of North Solitary Island. 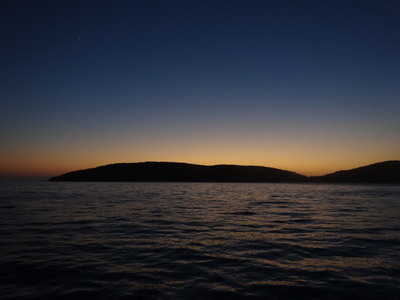 It is now daylight and we can safely pass a couple of rocks and shallow reefs. As we approach Coffs Harbour, we see some more whales, these are southern right whales we think as they have a different blow hole pattern, their breathing vapour comes out in a V shape. As we watch the whales a boat comes towards us. 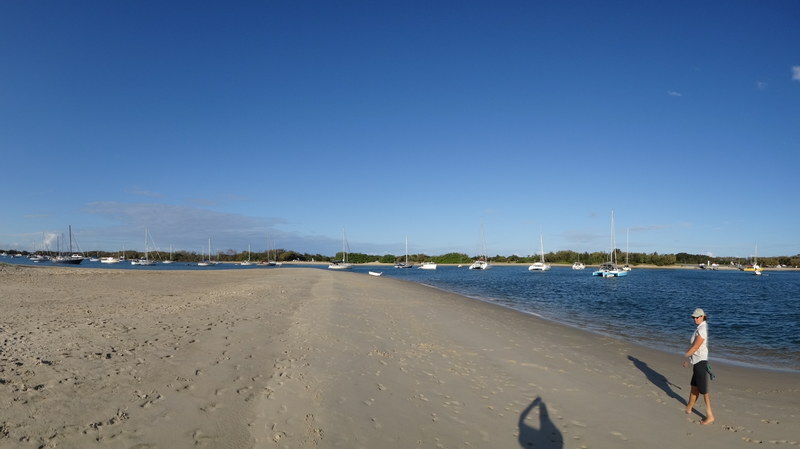 It is our diving friends Robbie and Janine Mapstone who live just north of here at Woolgoolga. They are on their way out to South Solitary to dive. We invite them to come to Catlypso for morning tea when they finish. 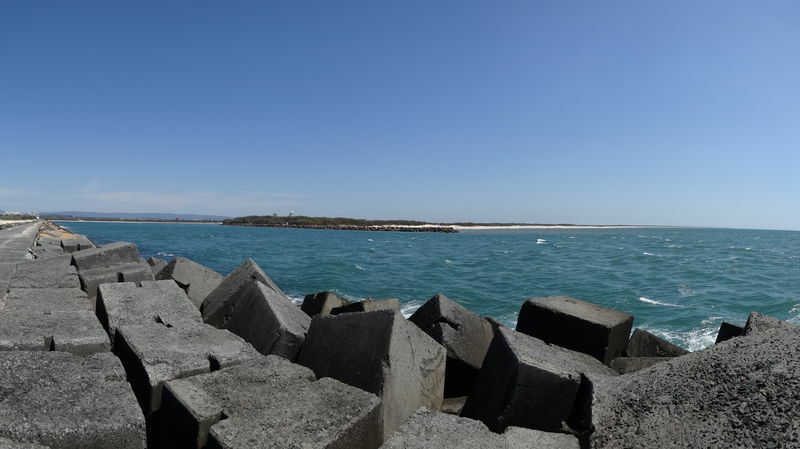 We enter Coffs Harbour, noticing that the southern breakwater has been considerably enhanced since we were here in May. As there is a northerly blowing, we anchor off the old steamer wharf. We anchor on the southern side as Trade Runner is anchored on the north and there is not that much space there. We take Veto to the boat ramp, she is very relieved that is for sure. As we come back to Catlypso the wind increases suddenly to over 20 knots. We go to bed and try to get some sleep but do not. After perhaps 45 minutes, we get a call on the VHF from Robbie to say they are back. The strong wind has meant they only did one dive. We get up and have a late morning tea with them. They offer to take Michael to get some diesel after they take the RIB out of the water. Michael transfers 59 litres to the main tank from containers and fills it. We help them put the RIB back on the trailer and Robbie takes Michael to get the fuel. Once back, they head off home and we go back to Catlypso. We now have a full supply of fuel again. The wind has again come up and is now over 30 knots outside the harbour it seems and over 20 inside. Kelly checks the weather for the next few days and it only looks good now for tomorrow. She then goes and has a small nap while Michael flushes the watermaker, checks the starboard rear bilge (the one that was leaking - now appears fixed) and the engine oil. Late in the afternoon we go to take Veto to the beach but stop off at Trade Runner to see what they have planned for tomorrow. They invite us on board and Michael has a beer with them. We discuss last night's sail and they also comment that they had a problem with a fishing trawler. 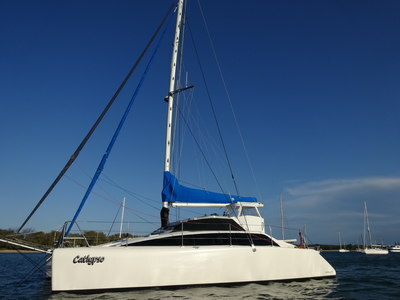 We tell them that we plan to leave tomorrow at 0330 and sail to Port Macquarie. They have not yet decided what to do. We then take Veto to the beach and come back to Catlypso for showers and sundowners. Now that we are on daylight saving time, it is light till well after 1900. We have the chicken curry and rice that Kelly cooked two days ago for last night but which we ended up not eating. As indicated, we plan to get up tomorrow at 0300 and leave at 0300 so that we arrive at Port Macquarie and cross the bar at or before 1430. It about 70 nautical miles, so that means we need to average at least 6.4 knots for the whole trip. By the time we go to bed at 2100 the wind has dropped to 11 knots and the chop coming into the harbour from the ocean has become less annoying.